Originating as a high performance shoe with a reliable nub grip for driving, the driving moccasin has become a staple for the relaxed and fashionable lifestyle. Soft suede and a cushion nub bottom make this an ultra comfortable style, inside the car and out. 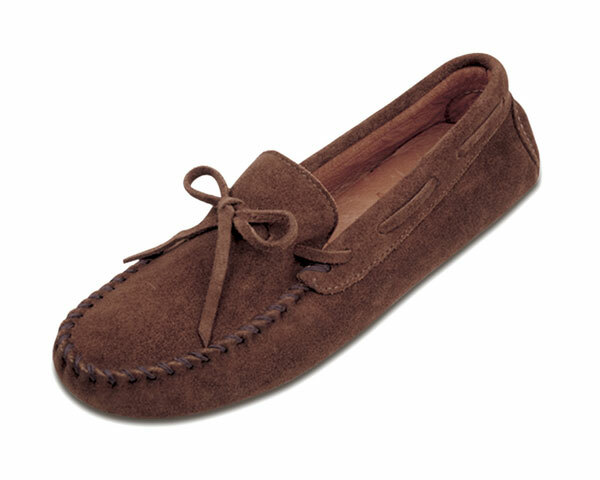 This soft, supple, suede leather classic driving moccasin has whip-stitching detail on the toe. Wrap around laces with a thin leather bow for a custom fit, and slip on ease with pigskin lining for comfort and long-wearing nub bottom for durability. Moccasins Direct: Guaranteed low prices for Minnetonka – We have many styles of Minnetonka slippers for men and women including mules, sheepskin lined, and traditional pile-lined mocs in hardsole and softsole looks. We guarantee that our prices are the absolute lowest you will find anywhere on the internet. If you find the same moccasin at a lower price from a competing website, we will immediately refund the price difference plus 10%. Free shipping on 2 or more pairs.